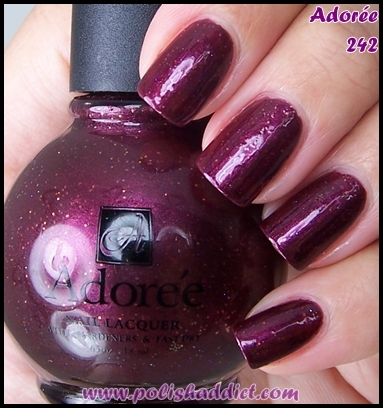 Adoree 242 is a tyrian purple with multi-toned glitter. 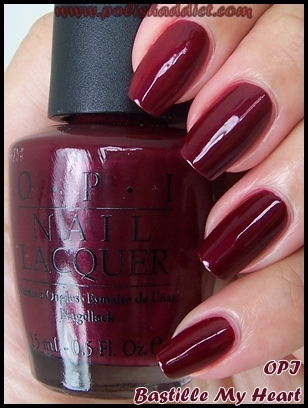 This swatch is 2 coats plus 1 coat of Seche Vite. 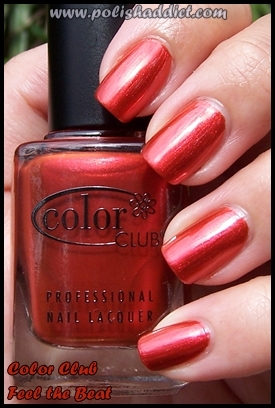 Unfortunately, this polish dries bumpy because of the glitter. 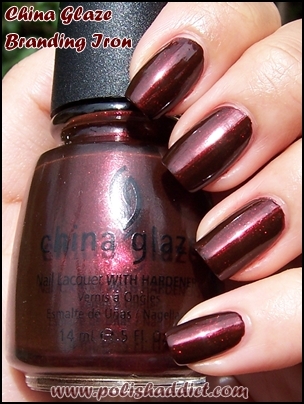 However, a coat or two of Seche satisfactorily takes care of the bumpiness. 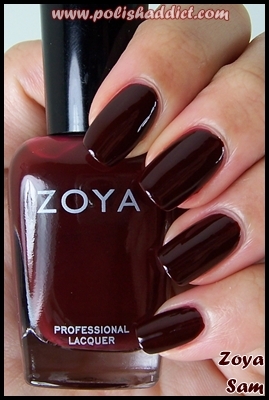 Adore 245 is a tamer version of Orly Goth. 245 is solid black with small silver glitter, no bumpiness issues with this one. 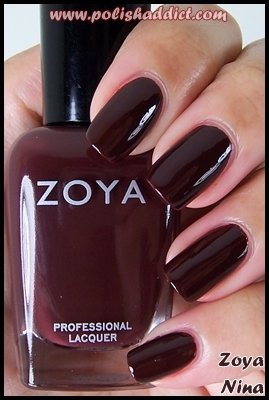 The black isn’t jelly but it does apply very thin so I needed 3 coats for opacity. 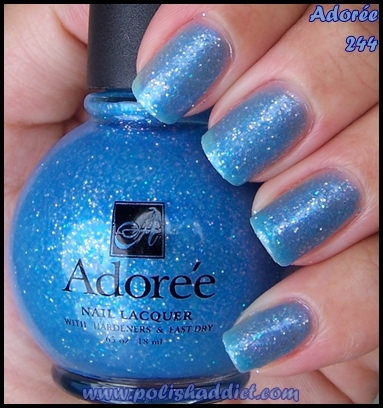 Adoree 244 is a jelly-ish light blue with multi-toned light iridescent glitter. 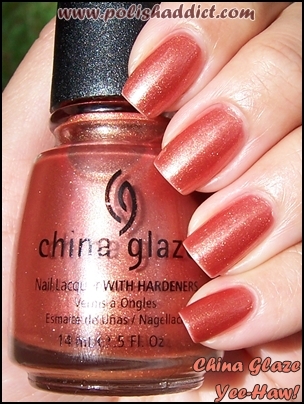 The finish, which is like a mixture of frost and shimmer, reminded me a lot of Adoree Peony’s finish. 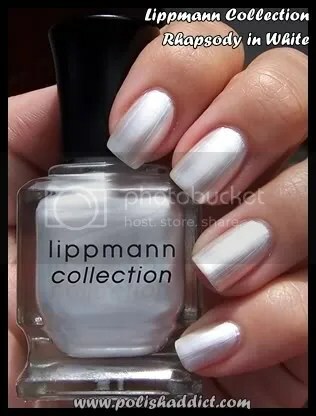 This swatch is 3 coats, no bumpiness but there is visible VPL. Adoree 243 is tough to describe. 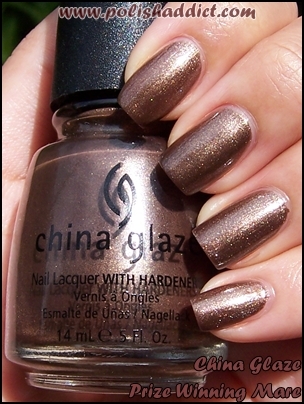 It’s a very dense pink, silver, and possibly gold glitter suspended in clear polish. 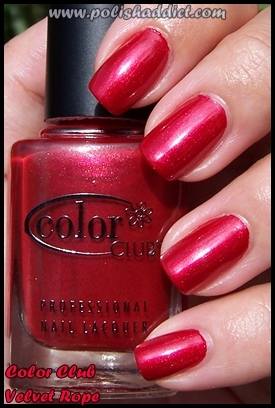 This swatch is 3 coats. It did look good with 2 coats though. I just really loved it so I got a little carried away during swatching. 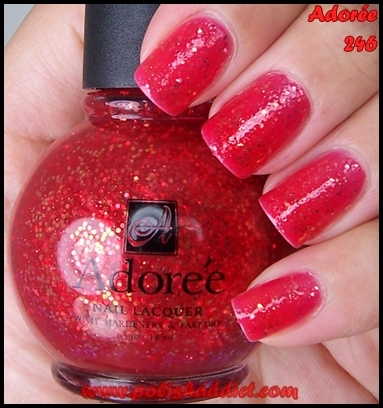 Adoree 246 is a jelly red with multi-sized orange toned glitter (similar to the glitter in Adoree Riding Hood.) Let me assure you that it’s a lot prettier in person than it is in my image. 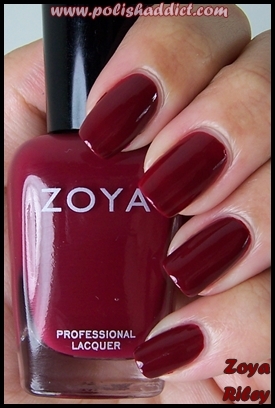 The formula is a little on the thick side but still workable. It also looks good over black which can be seen at the bottom of this post. 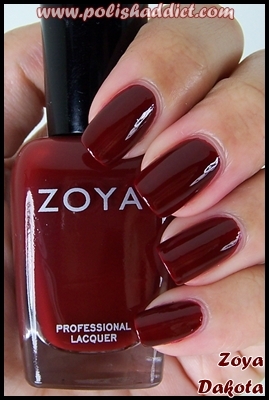 This swatch is 2 coats. 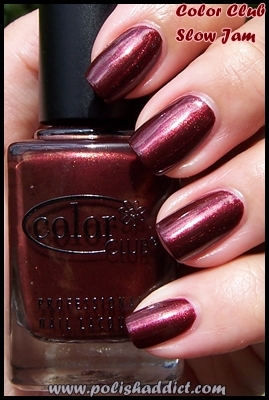 I apologize about the sloppiness of the these swatches. I was in a bit of a hurry but wanted to show you guys what these two colors look like over black. 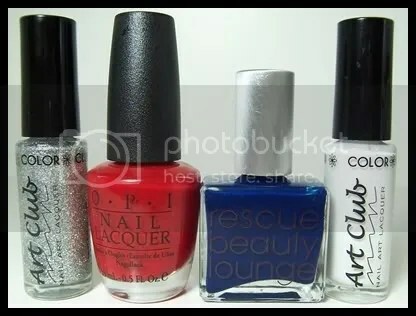 I used two coats of Milani Black Magic and 1 coat each of Capri Seas and 246 respectively. Capri Sea blew me away, really amazing. 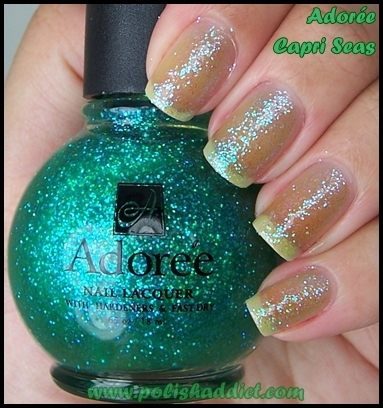 Adoree is available from Esther’s Nail Center in the U.S. and Pro Nail Store in Europe, specifically Sweden. Oh the horror (… dun… dun… dunnnnn). 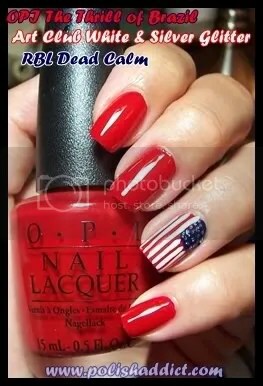 This was my 2nd or 3rd mani after the Tragic Nail Breaking Incident of 2008. 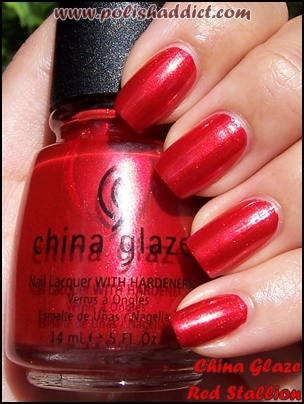 I decided to revisit it today because, well, my index nail broke again. I’ve dubbed this break the “Tragic Nail Breaking During Swatching Incident of 2008”, the whole sordid tale will be disclosed at a later date. In any case, I began waxing poetic about the deeper meaning behind a broken tip. It’s like the time I fell off the treadmill at the gym and had an existential crisis, there are existential implications here too. My nails break, therefore I am? Descartes just turned in his grave, I’m sure. I never posted this swatch because I really fudged the application and I was so defeated by the break that I just didn’t have the strength of will to clean it up. 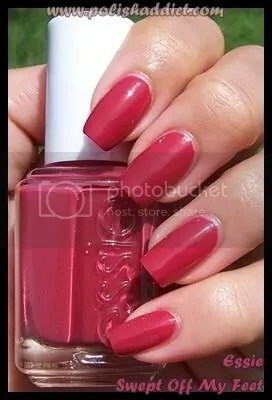 So, that’s my big secret, sometimes I just paint my nails however and wash off the excess in the shower. In fact, the only time I ever do real clean up with a little orange wood stick, remover, and cotton, is when I’m swatching for you guys. 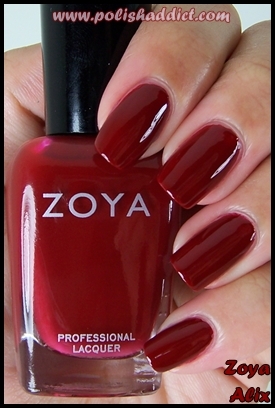 For regular manis, if I mess it up, which I do sometimes, I just let it ride.